How much data you see, though, depends on the exposure mode you used to take the picture. The screen on the left shows the data dump that occurs when you shoot in the advanced exposure modes, where you can control all the settings indicated on the playback screen. When you shoot in the other exposure modes, you get a far-less detailed playback screen. If you’re interested in the Shooting Information display mode, you’re probably shooting in the advanced exposure modes, so the rest of this information concentrates on that level of playback data. To that end, it helps to break the display into two main areas: the upper portion of the display, which contains general photo information, the thumbnail, and histogram, and the bottom half of the display, which contains several scrollable pages of detailed information. The top portion of the display contains a wealth of information. The top row contains the same information as shown in the top row of the Basic Information display. Beneath that is a thumbnail of the photo or movie, the date and time it was taken, and the histogram. Detailed information: This view, shown first by default, contains detailed shooting information. If a data item doesn’t appear on your monitor, it simply means that the feature wasn’t enabled when you captured the photo. Row 1 data: This row displays most of the same data as the bottom row of the Basic Information display mode, plus the Shooting (Exposure) mode. Row 2 data: These values relate to color settings. If you used flash without any Flash Exposure Compensation, you see just the lightning bolt symbol. Row 3 data: The bottom row holds the information you see below. Several other symbols may appear on the bottom row, depending on whether or not you used HDR shooting, Multi Shot Noise Reduction, multiple-exposures, time-lapse movie images, cropped, processed, or applied Creative Filters to an image. Lens/histogram information: This page shows detailed information about the lens you’ve mounted and the second type of histogram. You’ll see the brightness histogram on this page unless you change the Histogram Disp option in Playback Menu 3. Lens information is on the left; the histogram is to the right. White balance information: This page shows white balance information. The setting name, symbol, and the amount of correction you may have dialed in are shown beneath the photo thumbnail. The white balance grid, which occupies the lower‐right area of the display, graphically shows the amount of correction applied to the photo. 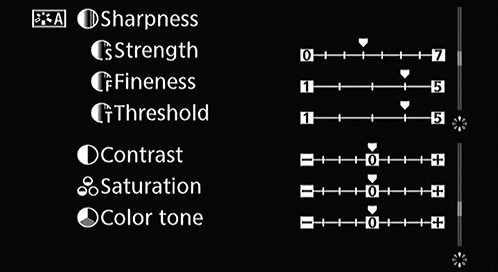 White balance settings, including the grid. Picture Style information: The Picture Style information pages show the current Picture Style and detailed settings. The information takes up two pages. Picture Style information includes the detailed settings. Color space/noise reduction information: This page lists three bits of information. First, the color space you have assigned is shown. Beneath that are the current noise reduction settings. Color space and noise reduction settings. Lens Aberration Correction information: This page summarizes the lens correction options that were set on your camera when you took the photo. This page summarizes lens correction settings. GPS information (not shown): If you shot photos with the separately sold GPS Receiver GPS-E2, you see a page with GPS information such as the location, elevation, direction, and precise time the photo was taken.